It was not until after nearly a hundred years since the first stapler was produced that the nail gun was invented by three construction workers from New York City. Once it came out on the market in the middle of the last century, it was adopted by contractors and carpenters all over the industrialized world, saving countless hours of labor and lots of sore thumbs. Nail guns have developed and evolved into super-specialized complex pieces of machinery with different types, applications and power source. The three major types of nailers are framing, finishing a, d brad. A framing nail gun is the strongest of them all, capable of driving thick gauge nail through engineered wood and even metal as easy as using a power stapler, followed by the finishing gun which uses medium gauge nail to hold and bind baseboards, moldings, and such trims. Lastly, the brad nailers use thinner nails called “brads”, which leave smaller holes on the wood and are perfect for detail work such as fine trims or cabinetry. As in many other power tools, the world of nail guns is divided between pneumatic or electric power source. Both technologies have their pros and cons, and there is no consensus in which is superior. Air compression systems are highly reliable and consistent systems, with a lower price tag than electric systems, but there are situations where a hosed gun is not an option and a cordless nailer is the best solution. Ultimately, is about being informed and make the best choice for our needs. For this reason, we have put together for you this buying guide, featuring the best nail guns out there in the market this year, with all you need to know about them in order to help make the best purchase possible. Another great choice for detail jobs, this 18 gauge nailer is a much lighter and maneuverable tool than our top rank, weighing in 2.2 pounds, it's the perfect tool for projects requiring long hours of use. Also of professional quality and built-to-last assembly, this pneumatic nail gun is the perfect sidekick for any serious and busy carpenter. This well balanced and small dimensioned brad nailer will go into places where most professional-grade guns will not, making it ideal for long hours jobs or where space is a limit, such as cabinetry and furniture. Capable of driving up to 2 inch long brads while leaving the smallest evidence on your finished surface, you will love its performance and capabilities. The fact that this product is small and lightweight does not mean it sacrifices quality and features. Its selective actuation lets you choose between bump and contact fire modes at the flip of a switch, while its operation and setup are completely tools-free, including jam removals and magazine reloading. The depth-of-drive dial allows you to get that professional work that you or your company is looking for. The world-renowned manufacturing giant Hitachi has come up with an excellent piece of hardware for both professional and home applications with a surprisingly low price tag. 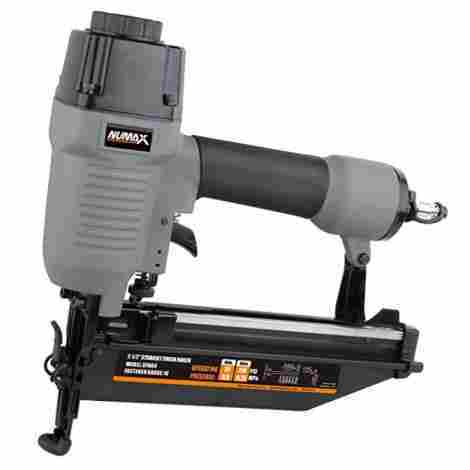 Its lightweight and ability to reach small spaces have made it a favorite amongst carpenters, contractors and DIYers alike, as you can read by its reviews and comments. The next product stands out from the crowd, for being an outstanding quality and versatile power tool at an incredibly low price. This tough aluminum-case straight finishing nail gun has tested itself against the major industry giants and proved that it does deserve to be the second place in our buying guide. Shooting 16 gauge nails, with adjustable depth and sequential firing, it has many uses for all different kind of projects. This upcoming brand has gained some decent market share in recent years, committing to top tier customer service and high-quality products, plus all their tools and accessories are sold, distributed, serviced and warranted in the USA. The manufacturing process is submitted to strict quality guidelines to ensure the best possible product, suitable for hobby and DIY projects alike. 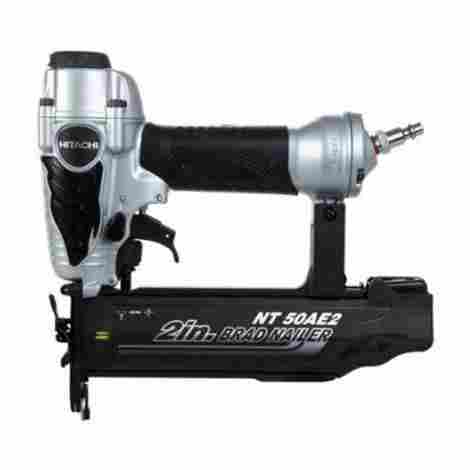 This pneumatic finishing nailer is the perfect tool for any finishing job, ideal for a wide array of uses both in- and outdoors, straight finish nails are great for trim, furniture, crown and shoe molding, cabinet work, window casing, staircases, railings, baseboards, etc. Provided with a standard 1/4" NPT fitting, comes ready to connect to your air compressor, and the anti-dust cap will keep the inside of your tool clean even after storage. You will not believe the price of this product! At first, we had our doubts about the NuMax SFN64, mainly because we could not believe that such a low price could offer any competition to other well-established brands in terms of quality and durability. But after lots of research and countless happy stories from the customer's reviews, we could no longer ignore it. This nailer has made its way almost to the top, due to its cost and value combination. 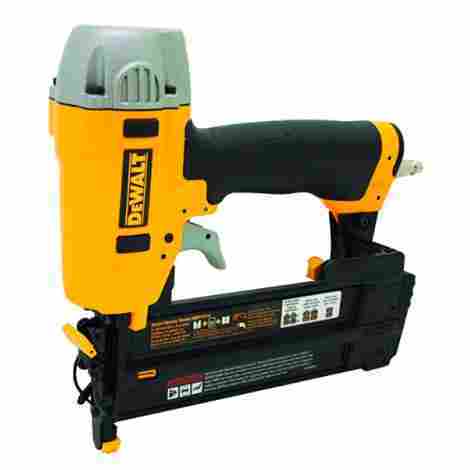 Our top choice is this fantastic brad nailer from the famous DeWalt power tools manufacturer. This amazing piece of equipment is tough built, and its maintenance-free motor lasts longer than your average brand, with outstanding performance in both hobby and professional leagues. With an affordable price tag, this product was not that hard of a choice when it came to rank it “Numero Uno” in our list. The best tools out there are designed so we don’t need additional tools to adjust, reload or even maintain them. This magnificent power nailer comes with an enclosed long-lasting maintenance-free motor, to prevent staining your work surface, and all three the jam-release, brad loading, and depth-of-drive mechanisms are tool-free. As most of the products in our list, this nail gun is powered by a hose connected to an air compressor, which is not included in the deal. Pneumatic nailers are highly regarded in the professional field because their depth of nailing is consistent throughout the whole day, unlike the battery-powered counterparts which power decay can affect the finishing work, and become a nightmare. If you are serious about getting a brad nailer, this product is a perfect choice: great quality equipment at an affordable price, it does not get better than that! Produced by a well-known brand, its three-year limited warranty hints away how confident DeWalt is about their product’s quality. 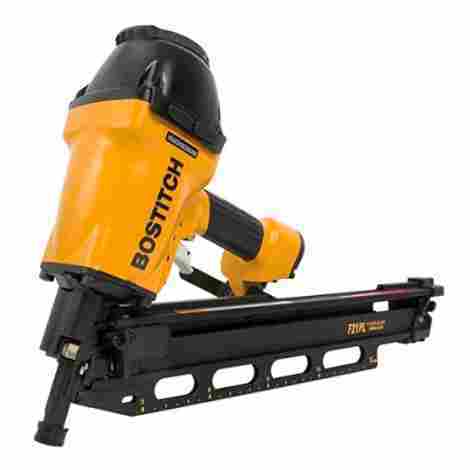 Moving into the “big leagues” of power nailers, we feature this beast of nail gun capable of delivering a good solid pound on any engineered timber. 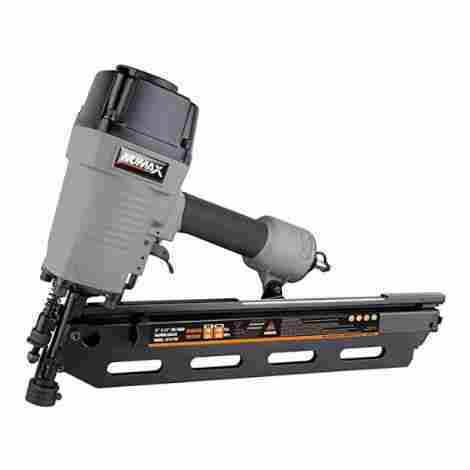 Specially designed to connect framing elements both timber and metal, this angled nailer is must have for any professional contractor, manufactured by a titan of the industry and backed up by a seven-year limited warranty, it is no wonder this product made it to the top ranks in our buying guide. This tool will be the last framing nail gun you will ever buy, with its durable yet lightweight magnesium casing and integrated rubber skid pads, it was designed and produced with the benefit of the worker and the job at hand in mind. Its patented depth selector system allows you to set the depth of drive at the push of a button, and complete with an adjustable rafter hook you can hang it from any joist during breaks from it. This 8.1 lbs bad boy delivers an astonishing 1050 inches-pounds of driving power, making best at its class and capable of handling the toughest timber. Including quick-change nose accessories, you can switch from timber framing to metal connector function in seconds, turning it into a highly versatile nailer at any construction site. Climbing up on the tier ladder, it is expected for prices to climb as well, but if you are experienced in the construction industry, you value the quality and power output of your power tools, and you understand that the initial cost of the purchase will surely be outweighed by the benefits in saving countless hours at the site. For this and many other reasons, we believe that this product is a solid investment in your framing enterprises. For those cases where a hose/cord is not an option, or simply because owning an air compressor is not on your goals, a battery-powered tool is your best alternative to pneumatics or any other systems, such as a corded/electrical or a compressed gas canister.Cordless nailers are the secret weapon of many contractors when swift action is needed, or remoteness of the job hinders the effectiveness of conventional power sources. The engineers at Porter-Cable have developed a full line of cordless power tools with interchangeable power source called Linked®. These electric cells are way more reliable and longer-lasting than the traditional NiCad battery packs, providing power up to 1300 nails per charge. The base charger and one power cell are included with your purchase, and the battery has a belt hook integrated to it for your convenience, and complete with a LED headlight, this deal is a steal. This nailer is not only ideal for the occasional DIY around the house, where perhaps owning a pneumatic system has not been on your shopping list at all, but is also a great choice for industry professionals who will know that there are times in a project when the cord on your power tool is damaging your productivity. Rated as the lightest of its class with a total of 5.9 lbs, including the battery pack, and with a magazine capable of holding up to a hundred brad gauge nails. Electric systems are of course more expensive than pneumatic ones, but it does not mean they cannot represent a great deal. If you are buying your first pneumatic tool and you are not a professional, you have to consider the costs of buying the needed air compressor with hose and fittings for its use. 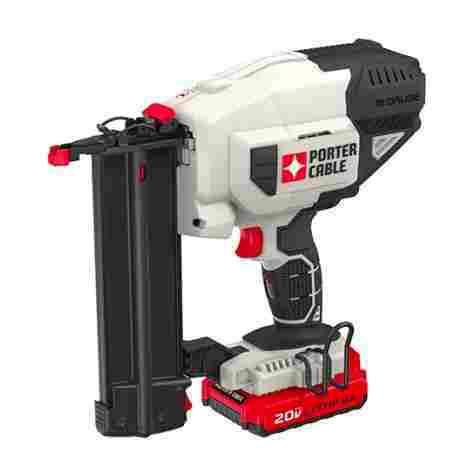 So if you are an occasional DIY nailer without a compressor or a professional looking for an alternative power system, we believe this is the perfect choice for you. Another great product from this manufacturer in our guide, this time featuring a more powerful angled framing nailer. This is the ideal choice for someone who is looking to do some serious DIY project, such as expanding that part of the house you need for your growing family or building that much needed shed on your back yard. This nailer has pretty good durability and output considering its low price. Do not think for a second that this price tag means fewer features or poor quality because it happens to have all the things we need and look for in our power nailer, including 360º adjustable exhaust, keeping that hot air away from your face, interchangeable “no-mar” and “no-skid” tips, and two different firing modes: bump or single, so you decide whether you care most about precision or finish. This product has amazing quality and performance when compared to similar products in its league. It may not be professional grade, but it is a great choice for any DIYer or amateur builder. Backed up by an upcoming brand with great service and warranties, this product will satisfy anyone looking to do their own self-construction. This nailer costs only a fraction of what professional-grade ones do and offers great durability and quality for occasional projects. If you are looking to save some money on a tool that you will not be using too often, then this the perfect choice for you. Owning such a tool in your home will surely broaden your abilities to improve and expand your property given you are into handy work. We could not resist the urge to feature this amazing deal from the people of Freeman tools, which includes framing, finishing, and brad nailers plus a narrow crown stapler gun, a full set to help you throughout every phase of your project, from framing to detailing, from boarding to trimming. A sister-company of NuMax, the Freeman brand offers better tier products than the before mentioned, with professional grade built, durability and performance. Complete with a canvas bag to help you carry and store your tools properly, this 4-piece set is as good as it gets for its value. Acquiring this product and everything it includes will give you the freedom and potential to pursue any carpentry project you can set your mind on, from framing entire spaces, nailing studs and rafters, boarding them up, trimming and moldings, staircases, floor baseboards, railings, furniture, cabinetry, fine detail trims and much more. From the same umbrella corporation than the twice featured brand NuMax, Freeman goes one step beyond in quality and performance, raising the bar of its products to a professional grade. An what better way to stand behind it than to offer this great deal, any contractor’s dream set, which will fill your own enterprise of productivity and effectiveness. Select the right tool for the job and get a professional finishing every time, no matter the challenges. Given that all products included in this set perform amazingly in a professional environment and come at a great bundle price, it is a great opportunity for any upcoming carpenter or building contractor, who is on his way of building up his business and needs to save every penny in order to push the extra mile to make it through and place himself in the market. Offers like this one do not come this often, a would be a mistake not to consider it at least. Number eight in our rank brings a budget tool for those looking for a reliable but cheap tool, that would last you long if taken cared of and not abused. This pneumatic brad nailer covers all the basic features you need on a power tool of its class, at an amazing price with above average quality. This nail gun is the perfect addition for your DIY shop in your garage, but remember that air compressor is sold separately. This product offers all basic features needed in your brad nailer, with an adjustable exhaust vent to keep hot air away from your body, quick-release jam access, a spacious 100-brad magazine with gauge, safety contact tip to protect your work surface, rubber grips and balanced aluminum body for optimal control, and a depth-selection wheel that allows you to choose the depth-of-drive of your brads. For a budget machine, this product really exceeds expectations in terms of quality of the job rendered and durability of the power tool itself, given that is not abused on a daily basis in a professional environment. This class of tool is ideal for DIYers and occasional craftsmen, who know how to properly care for their tools and can’t afford to invest too much on them. Fitted with a standard 1/4" air inlet, it can be hooked to most air compressor and hose systems. This product scores highly in our cost/value chart since if used and cared for properly, it will yield lots of hours of work at a minimum price. All depends on your current situations and needs, but we believe for its class, the Wen 61720 Brad Nailer is solid representative. We had to include in our buying guide this hybrid power tool, a remarkable addition to any crafts bench or workshop. 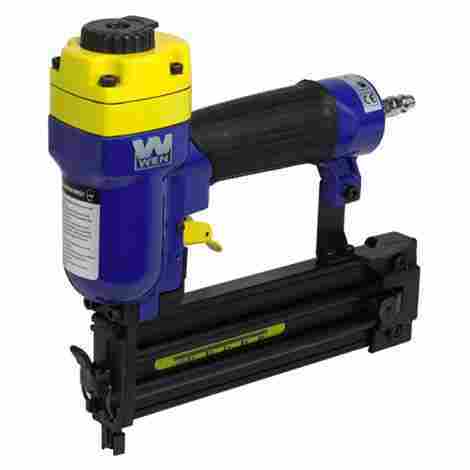 This dual-function product works both as a heavy-duty stapler and a detail-job brad nail gun, able to hold both types of connectors in its chamber. Power by a standard 8-foot electric cord, this little devil will do wonders for your crafts and DIY projects coming out of your workbench. Not only this gadget will work with your staples and brads, but also comes with a Hi-Lo selector button to adjust its power for hard or soft materials, giving you extra control on the job rendered. It works Stanley Sharpshooter TRA700 Series or Arrow T-50 heavy duty staples and 1/2-, 9/16- and 5/8-inch brads, for projects ranging from decorative wood trims and details to fabric and upholstery jobs. 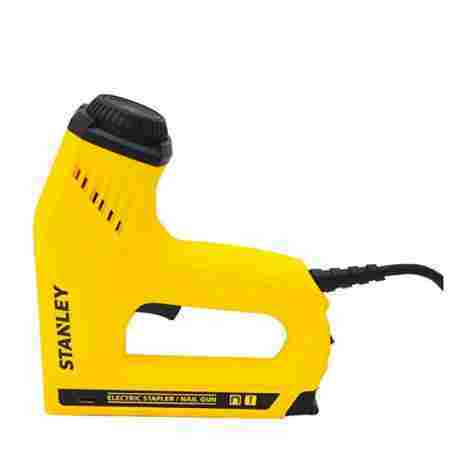 Known as a leading manufacturer in the field of power tools, Stanley TRE550Z will not only hold itself excellent in a home or amateur environment but is also rated for more work-intensive settings such as professional construction sites, where some of the work might require a more delicate approach than your average pneumatic gun. Performing amazingly in jobs that involve siding or paneling of various materials such as foams, plastics, fabrics, thin baseboards, etc. Having a cord significantly reduces the cost of electrical hardware, since alternate current systems tend to be cheaper and do not require a portable power cell. Although when compared to pneumatic systems in terms of power output, this hybrid gun does not perform as well. Keep in mind thought it is still a powerful and versatile piece of equipment, designed for specialty detail jobs where conventional nail guns cannot operate well. Last in our list comes the ultimate contractor’s dream, and also the perfect complement for this buying guide’s fourth-ranking product, the Bostitch F21PL Framing Nailer. 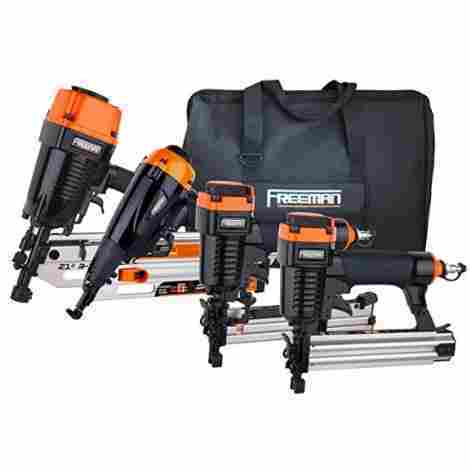 This four-piece combo includes 3 different application guns and a cordless 6 gal air compressor. It will surely knock a few hours a day worth of work from your project, and boost the overall productivity of your men. The set includes a straight finish nailer, a straight brad nailer, and a heavy-duty crown staple gun, giving way to potentially execute a wide range of jobs for a given project. If you know exactly what you are looking for, different two- and three-piece kit combinations are also available from the same retailer, to help you optimize your purchase, and whichever happens to be your choice, we are sure you will end up completely satisfied. 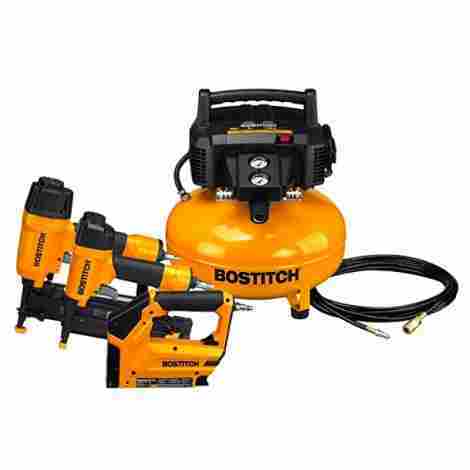 Apart from the great-performing nailers and gun included, the main feature of this deal is the amazing and revolutionary dual-tool portable air compressor from Bostitch, which features oil-free maintenance, safely protecting your work surface from accidental staining. Also, its high-flow regulator maximizes the air tool performance wasting less gas per discharge, and has low-noise level under 80 dB, for a quieter and less stressful work environment. For all this, is worth mentioning this amazing power source not only for Bostitch’s but for any pneumatic professional power tool. If you are a professional in the industry, you will know that all the above mentioned is worth gold. And to be completely honest, this product seems way underpriced for all its potential in terms of saving and optimizing your work at the site. So what are you waiting for? Just click on the link and get yours now! This buying guide is the result of extensive market research, which led us to the best of the best available out there. In the following section, we would like to share with our readers the features and characteristics of the products that were considered in order to rank our list. When talking to a contractor, engineer or architect, it always goes down to the numbers. One of the major drives behind every successful project is getting the most out of every resource input. Therefore, when shopping for a cost-balanced power tool, is an absolute must to give lots of consideration to the amount of power you are getting per every dollar spent. In the case of nail guns, this translates to the ability of the machine to deliver a consistent depth-of-drive throughout the workday and its lifetime, on top of the net power output of the power tool, usually measured in pounds per square inch or PSI. Even the simplest of construction projects such as a garden shed requires the use of such nailers for hours a day for a week or two, and consistantcy through the entire process is paramount to achieve professional finishing. In this buying guide, you will find only the best products of their respective class, not only in terms of power output but in every other criterion mentioned in the current section. Being a single-hand-held tool used during long hours at all kinds of different positions, and to make thing worse is usually is attached to a high-pressure hose or a heavy power cell, the best manufacturers take the weight and balance very seriously, everything from the materials chosen to the center of gravity is carefully thought of, in order to deliver the most comfortable experience possible for the worker, raising his overall productivity throughout a project. It does not matter if you are working on framing, trimming, finishing, detailing, molding, boarding, if you are a nail gun operator, you know your whole body suffers from all the different positions and angles you need to assume in order get the job done, especially your upper limbs get sore from holding the gun well above your shoulders for good part of a regular day. Therefore this list ranks products based on their design and intent to make the user experience as least stressful on the body as possible, keeping in mind that at different stages of a project they probably will be used for countless hours. Power tools are manufactured in different tiers, which go from the hobby all the way to the professional grade. All this ultimately translate into the quality, durability, and life of the machine, as well as the intensity of use -or abuse- the machine can suffer. Depending on the tier of product, the manufacturer designs its product with materials, features, manufacturing techniques, systems, and technology corresponding to such tier, and consequently affecting the final product cost and market. When selecting the products featured in this buying guide, we made sure regardless of tier or class of the nail gun, it was the best available in the market when it comes to quality and durability, in the hopes of this information will enable you to make the best purchase possible for yourself. Even if the pneumatic nail guns are the weapon of choice for most of the industry, we cannot say they are the best or only option out there. As we have mentioned before in this buying guide, there are cases when a hosed gun is not a choice, because of factors such as distance or accessibility, or even more basic things such as lack of air compressor. For this reason, even though our list is mainly dominated by pneumatic nailers, we have made sure we featured at least two other power source systems, and give you a choice for those situations where compressed air and hose are not an option. These two other systems are both electrical, one corded and the second cordless, which both have pros and cons of their own, but surely complement the professional carpenter or contractor’s arsenal. The ultimate goal of this guide is to give you the power tools you need in order to make the right decision for your case of purchasing a nail gun, hence a wide range of choices in power system was defining factor when we needed to narrow down our selection for the top ten nail guns out there. Since the invention of the nail gun in the mid-fifties, they have evolved and diversified into an incredible amount of variation for specific tasks, from framing and roofing, cladding and siding, trimming and detailing. This range of different applications also means a different type of connectors or “ammunition” for your gun, commonly known as nails, brads, staples and the likes. There are well over ten different types of nail guns for different jobs, so was impossible to feature all of them in a top ten list. So we have selected four of the most common and versatile types of nail guns, which combined can perform almost any job on a typical construction project. This selection includes framing, finishing and brad nailers, with a special mention to the heavy duty crown stapler, which is a close relative of the nail gun and performs similar or complementary tasks. Considering all the above-mentioned criteria, we have ranked all the products in our buying guide ultimately for their value, so that you can get what everyone wants: more bang for their buck! We have pondered and weighed all the pros and cons of every product featured here and come up with a list based on extensive research, crunching of technical sheets, customer experience reviews, the experience of industry professionals. It is our most sincere wish that you will find in this buying guide the perfect nail gun for you, and we rest assured that regardless of your choice from the list, you will be satisfied both with the information here given and your newly acquired nailer. Q: What is the difference between a nail and a brad? A: In short, the gauge. Brads are thinner than nails, leaving smaller holes in the wood, making them perfect for fine detail, but hindering their ability to bear heavy loads and provide strong fastening. Q: Why is an 18-gauge nail thinner than a 12-gauge? It doesn’t make sense! A: It is not crazy once you figured out. The gauge on nails for power nailers is not relative to their thickness, but rather to the number of nails that fits on a single one-inch long line. Therefore, gauges measure numbers of nails on an inch, and not the thickness of the nail itself, translating into higher gauges for thinner nails. Q: How come some nailers are built with a perfect 90º angled heads and others at apparently random angles? A: The angle of the nail gun depends highly on the specific application it was designed for. Some tools such as most framing- and some of the finishing-nailers come between 20 and 30º angles, so the can be used in corners and rims, allowing the connection of studs and other framing elements, as well as detailing jobs the likes of shoe and crown molding. This ability to get to the corners comes at the price of sacrificing some precision. The straight angled nailer allows a much higher degree of control and precision, but can’t reach all the way to corners, hence straight nailers are more common in brads and floor nailers. Q: Why do most pneumatic nailers do not come with an air compressor? A: Pneumatic systems are a fairly common power source for lots of power tools, you can have a wide range of tools, but chances are you use one or two at a time the most, so it is not necessary to own several air compressors in order to own several pneumatic tools. Think of it as your electrical outlet on the wall, you can power all your tools with one outlet in your workshop because you don’t use all your tools at once.